I'm not a big fan of super sugary candy, I just don't like the way it leaves my teeth feeling after I've eaten it. And I know it's not good for them or me either. That's why I was happy to learn about YumEarth Organics. They are made from all-natural ingredients and real fruit extracts. Plus they have 100% of your daily allowance of Vitamin C per serving. Another positive for me who has trouble getting in all of the vitamins I know I need. Of the four flavors Pomegranate Pucker, Wet-Face Watermelon, Strawberry Smash, and Perfectly Peach I would have to say the peach is my favorite. I'm not a fan of actual peaches, but I love peach flavored candy. They taste great and they don't leave a sugary film feeling on my teeth afterwards either. The fruit snacks came in banana, cherry, peach and strawberry flavors and actually tasted like little bits of fruit. Again they didn't taste like they were packed with primarily sugar like some fruit snacks do. I've actually put a few of the organic pops in my purse and some of the fruit snacks in my car for having on the run. We believe YumEarth tastes better because we choose real fruit extracts and planet friendly ingredients grown on sustainable family farms to sweeten our lives and yours...and because we love spectacular flavor and hand craft all our flavors to make them all tart and bright and delicious! YumEarth treats are made with all-natural ingredients, no artificial colors or artificial dyes, no gluten, no peanuts, and no tree-nuts, just award winning taste. Buy it: You can buy YumEarth Organics Treats at: YumEarth, Amazon.com , or at local stores. 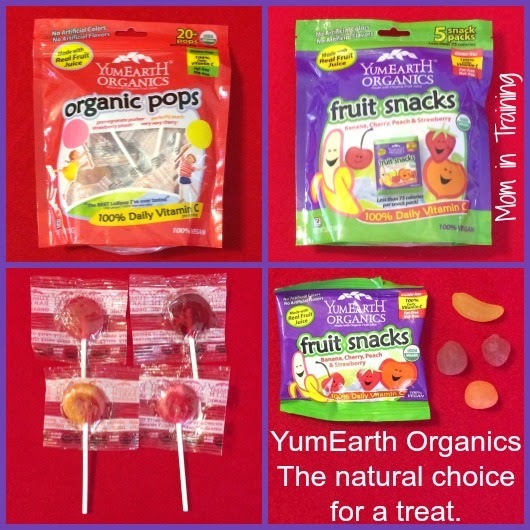 Win it: One lucky reader will win YumEarth Organics Lollipops and Fruit Snacks (value $15.98). This giveaway will end December 10th at 12:00 AM EST. The winner will have 48 hours to respond to my email. If no response, a new winner will be chosen. Open to residents of the US. I really like cherry flavored items. I like cherry flavored sweet treats! I love love love strawberries! I like grape--- cherry is good too. I love anything watermelon flavor! What's your favorite fruit flavor for a sweet treat?